The price of OPEC basket of thirteen crudes stood at $34.34 a barrel on Monday, compared with $32.34 the previous Friday, according to OPEC Secretariat calculations. Meanwhile, Wall Street Journal reports that oil prices fell on Tuesday as investors took profits from recent gains and some analysts warned it is too early to call a bottom to the market. Brent, the global benchmark, was down 0.56% at $40.61 a barrel for May deliveries, while its U.S. counterpart was down 0.92% at $37.55 on the New York Mercantile Exchange for April deliveries. The oil price has been on a roll recently, boosted by a rosier view of the global economy and on hopes of a supply freeze from some of the world’s largest producers. Brent has gained around 45% since January 20, and is still trading above $40 a barrel. But some analysts believe it is too early to sound the all-clear on this market. In a note on Tuesday, Goldman Sachs said that a price of $40 a barrel is unsustainable and a longer period of low prices is needed before the market begins to fully rebalance in the second half of 2016. More bullish investors back up their belief of better times by pointing to recent U.S. data that shows reductions in crude production. Oil production is also falling elsewhere, according to Energy Aspects. The London-based think tank says that production in Asia and Latin America fell by 0.18 million barrels a day and almost 0.2 million barrels a day, respectively, in January. The change in the supply outlook is causing some oil buyers to hold on to stocks for longer, resisting the temptation to cash in at the current high levels. 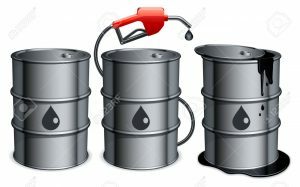 Analysts say that is a potentially bullish signal, showing that market participants expect oil prices to go even higher. Meanwhile, a weaker dollar could offer some support to prices this week. Oil is denominated in dollars, so becomes cheaper for many buyers as the U.S. currency weakens.